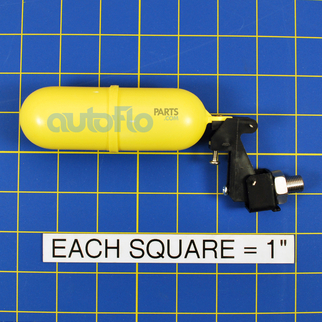 Autoflo 401972 Float Valve Assembly. Replacement float valve assembly for all AutoFlo humidifiers. Replaced by part 188 so you MUST order that item from us. NOTE: Part 188 will NOT work on model 200P humidifier. If you have a model 200P humidifier and need a new float valve for it you MUST replace your unit with a new model. You can contact us for a recommended replacement. The float valve was easy to install. It took a little time to adjust the float, but over all a quick ptoject. The float works very well. There were no installation instructions, but it was pretty obvious what needed to be done to install the float valve assembly. My only complaint is that the thumbscrew used to adjust the level of the float is on the left side, close to the side wall of the humidifier, making it awkward to use. You almost have to disassemble things to adjust it. But, once installed and adjusted, it works just fine. I"m a do it yourself homeowner. The float is very easy to install. The only thing that concerns me is that the float is a bit to long and hits the side of the pan. If the float has to be adjusted a little higher it might get stuck. If the float was a 1/4 inch shorter it would be better. The valve replaced the old one perfectly and works great.